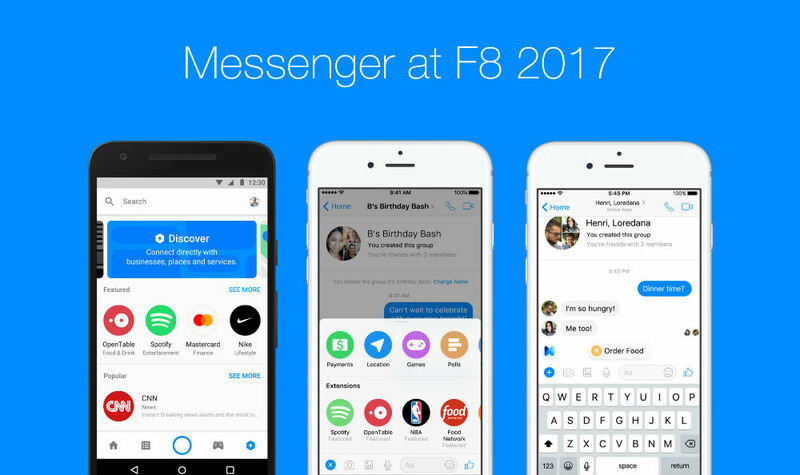 Facebook’s F8 conference kicked off this week, and with it, many changes were announced for Messenger. As you may have noticed over the past couple of years, Messenger is much more than just a messaging app these days. You can play games with friends, pay money to someone, utilize M (the virtual assistant inside), and even chat with businesses. This week, a lot of new stuff is being added in, so here are the details you need to know about. Right on the home screen of Messenger, you’ll notice a new tab called Discover. With this, you should be able to locate things you care about (based on your preferences) more easily. According to FB, the Discover tab can locate businesses, people, bots, and all sorts of things. Added in is also Chat Extensions. With this, multiple people can chat with a business at the same time. As an example, a Spotify bot can be added to a group conversation, which can then play tunes for everyone. There are currently extensions for Spotify, OpenTable, NBA, Kayak, and more. Another big change involves M, FB’s virtual assistant. You can now order food via M. The orders go through delivery.com, so as long as you live in an area the service supports, you’re good to go. For example, if you’re talking about Chinese food with a friend, M will recognize that, then offer up a local Chinese spot you can order from. Smart little assistant. There are a lot of changes that FB lists, so bear with me as I have pasted them below. Discovery in the Digital World – Discover tab: We wanted to find a way to make it easy and simple for people to find the businesses they care about in Messenger. We’ve built a Discover tab, and starting to roll out to a few people in the US today, right from the home screen, people can find their recently used bots, popular experiences and a free-form search field. Discovery in the Physical World – Messenger Codes: Our new parametric QR codes will enable people whenever they are out and about at events, like at basketball games and concerts, to be able to find out more from a bot for Messenger, just by simply scanning the code in the Messenger camera. Chat Extensions: With Chat Extensions, we enable multiple people to chat with the same business at the same time. If you are excited to share the newest song you love, you can now add a bot directly in a group thread and share the conversation and experience with your friends. You can currently find favorite brands like Spotify, TheScore, OpenTable, Food Network, NBA, Wall Street Journal and Kayak — with many more on the way. More from M: M, our virtual assistant, can now offer the ability to order food through delivery.com. If you’re chatting with friends about what to grab for dinner, M may suggest placing an order. The whole experience can be completed in Messenger, including group ordering and payment. The more you use M, the more it will make relevant suggestions to you. This is available in the US where delivery.com serves. Introducing New Rich Gameplay: With over 1.5 billion games played in just the last 90 days, now we are adding some additional product features like game bots and Rich Gameplay (turn-by-turn games) to make your gaming even more fun. Smart Replies for Pages: Today, we’re launching the ability for Pages to respond to the most frequently asked questions, such as business hours, directions and contact details. Parametric Messenger Codes: Businesses are now able to generate multiple parametric QR codes for one bot, offering their customers more choice. For example, to track where a code was scanned, or to apply a different QR code for each table at a restaurant. This also gives people the potential to scan via the camera instead of the QR scanner feature. Hand-over Protocol: We’ve provided a way for businesses to work with multiple developers for different experiences on Messenger. For example, a business might want to have a personal shopping bot and also a customer service bot. Different vendors and developers will be able to manage the conversation for the use case the customer is requesting. There it is, everything new for Messenger that was announced during F8. Information overload, am I right? You can find the latest Messenger by following the Google Play link below.